Why? Because we would love to keep you updated & informed on our work, events, new music and of course, Joe Strummer related news & insights. We take privacy very seriously, and will never use your email address for anything other than keeping you updated with The Joe Strummer Foundation. Thank you for your support. Join Us On Our Journey. 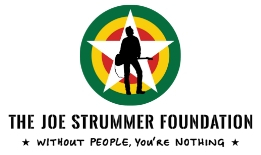 The Joe Strummer Foundation’s important work is only possible because of the support we receive. Subscribing to our news & updates to sure-fire way for us to know you care.